Improved target recognition at medium range distances. 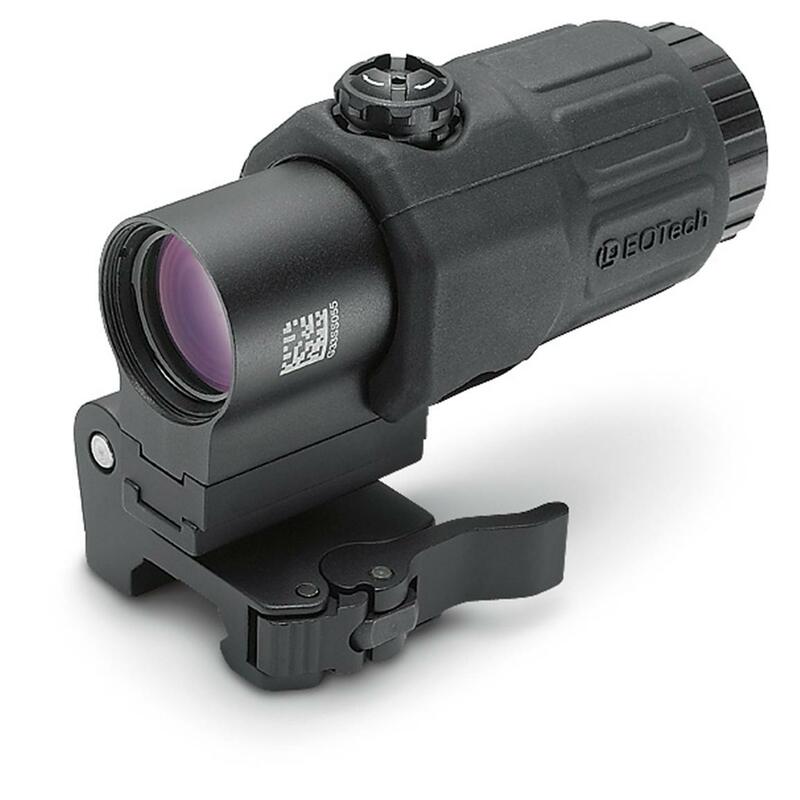 EOTech G33 3X Magnifier is rated 4.7 out of 5 by 9. Rated 5 out of 5 by Michael from Excellent Magnifier The G33 is the PERFECT magnifier for an EoTech and through its specs and extremely clear glass, it really is an excellent tool for the trade.Despite its price, it is worth its weight in gold. Rated 5 out of 5 by hackmeister from Best red dot magnifier out there This magnifier is simply the best red dot magnifier on the market. I've used it with my EOTech red dot but also Holosun and Primary Arms. It works well with all. The glass is clear and the mount is excellent. Easy to flip when alternating between close and distant shots. Great deal with double discount and I happened to catch a $75 rebate from EOTech. I highly recommend this product. Rated 5 out of 5 by Dave from Great Product for a Great Price! arrived on time. great product. On sale with a rebate! just what I was looking for. those 200 yard shots are a breeze. you can't go wrong with this magnifier! Rated 5 out of 5 by networkman from EOTech G33 3X Magnifier This was an exceptional bargain : Club double discount and free shipping!This is the only real mate for your EOTech sight. It is very well made and works as advertised. Rated 5 out of 5 by Serpent from Excellent Magnifier This Magnifier works great, easy to adjust and mount, easy to flip in and out of your line of sight. Reticle even looks better when viewed through the magnifier. Eotech high quality. Rated 5 out of 5 by Geno from Worth every penny! I had already purchased and EOTech EXPS 2-2 holographic sight, but was having a had time with my vision to sight in at longer distances. This magnifier did the trick. If i lost this for some reason, I would buy another one. Rated 2 out of 5 by DAVID from This is my forth Eotech product. I always love the quality construction. At first glance, this appears to meet the same quality standards. Incredible clear optics and solid mount. However, the eye relief is so short and the window of eye relief is so narrow that it makes it impossible to use effectively. I mounted to AR. There is just enough room on the top for one of the smaller eotech red dots, this magnifier and a folding BUIS. This causes major eye relief issues. Not worth the money.